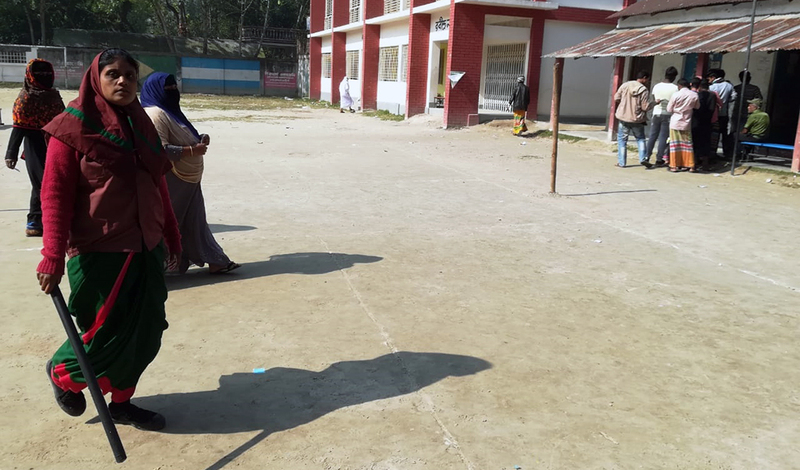 Voting in three polling centres of Sirajganj and Habiganj district was suspended on Saturday over allegations of irregularities and snatching of ballot papers. In Sirajganj, voting in a polling centre under ward no 1 in Sadar municipality was suspended following allegations of irregularities. Presiding officer Anwar Hossain said that voting in Mahmudpur Government Primary School center was suspended at 2:30 am as some local influentials were pressurising to stuff ballot boxes at night. Following a written complaint by the Presiding officer, district returning officer Abdul Hossain and executive magistrate Mohammad RahmatUllah visited the centre and suspended voting. Meanwhile, presiding officer Anwar Hosain and two assistant presiding officers- Abdul Alim and BelalHossain—were detained for interrogation. In Habiganj, voting in a polling station of Azmirigang upazila was suspended for snatching ballot papers by some miscreants. Presiding officer Mohitush Sutradhar, said that around 100 people attacked Paschimbag Government School polling centre and snatched 163 ballot papers. Later, the authorities suspended voting. Besides, voting in Shahpur government Primary School centre was suspended in Baniachong upazila following an attack around 11am. Six people, including presiding officer Jahir Alam, police constable Jamal uddin, ansar member Abdur Malek were injured in the attack, said Baniachong upazila nirbahi officer Md MamunK handaker. Besides, a group of miscreants also attacked Ikram Government primary school centre of the upazila. But police brought the situation under control. Voting in the first phase elections to 78 UpazilaParishads in 12 districts is underway on Sunday.